Here are a few borrowed screenshots to illustrate how to get the IP address of a dialup modem user in Windows XP. Yes, believe it or not I do run into dialup connection support once in a while. This is particularly tough to troubleshoot since I don’t have any dial up connections configured on my laptop – I don’t even have a landline at home! Note: If the user has access to a web browser, visiting a website such as WhatIsMyIP.com is probably easier. 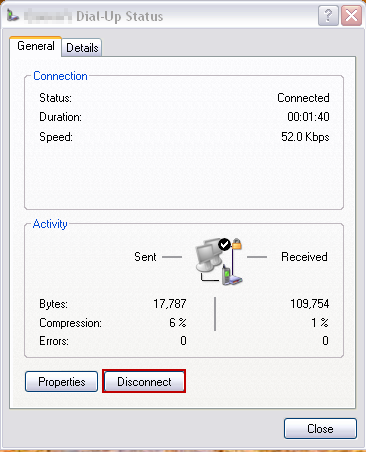 When the dialup modem connection to the user’s ISP has been established, the “two overlapping computers” icon is added near the time at the lower right of the screen. Right click on it to open a pop up dialog. That opens this window, with the General tab selected. Left click on the Details tab. The user’s IP address is Client IP address, of course, if you’re reading this, you probably know enough to have guessed that. Phew, first blog post in months. It’s crazy how time flies when there’s a lot going on.